Live stream the event featuring Mike WiLL Made-It, WondaGurl and Tinie Tempah. 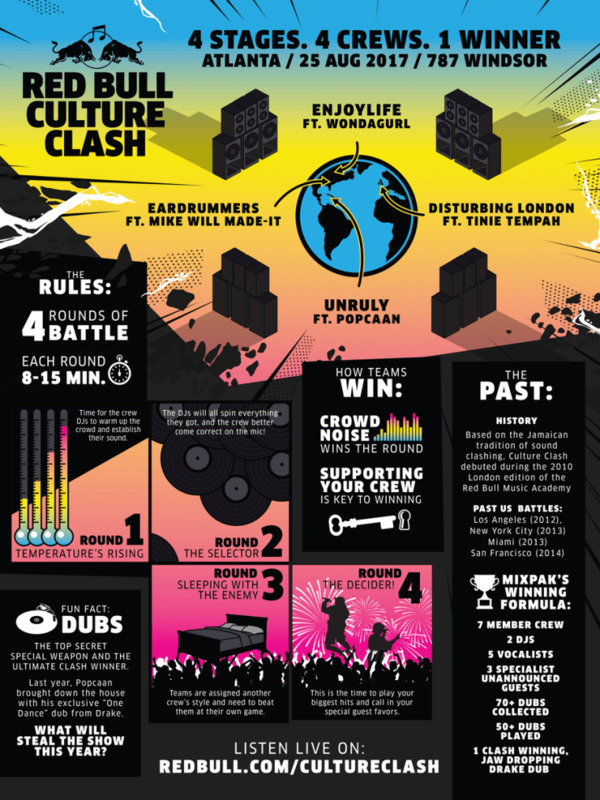 The Red Bull Culture Clash will be live streamed this year. Four teams, EarDrummers featuring Mike WiLL Made-It, Enjoylife ​featuring WondaGurl, Disturbing London featuring Tinie Tempah and, Unruly featuring which is no longer featuring Popcaan due to travel issues. Popcaan was part of the U.K.'s winning team last year. Mike WiLL Made-It's team, repping Atlanta, will also include Rae Sremmurd’s Slim Jxmmi and Swae Lee, DJ Cash, DJ Osh, Eearz, Jace of Two-9, Aubz and Bwrightous. Toronto's Enjoylife, featuring WondaGurl, will be joined by Southside, TM88, Nessly, Rich Kidd and Bluxz. Disturbing London repping artists from Nigeria to the U.K. Charlie Sloth, Yxng Bane, Yungen, A2, DJ Charlesy and Mr. Play will join Tinie. Many more guests are expected and will be announced throughout the night. The Culture Clash pre-show will begin at 8 p.m. and the event will begin at 9 p.m. EST, and can be watched on the live stream below. During EarDrummer's turns, Mike WiLL Made-It brought out Sahabii, Fabo, Ludacris, Young Chop, Pusha T, Junior Reed, and more. Team Unruly brought out Jermaine Dupri. Round 1 saw EarDrummers bring out Rae Sremmurd, and Unruly was the first team to play Bodak Yellow. Disturbing London brought out Charlie Sloth and brought the U.K. flags up. In Round 2, the teams threw more serious shots at each other. EarDrummers brought out OJ Da Juiceman and Pusha T.
After four rounds of back and forth, team Unruly won, despite losing their team leader, Popcaan.